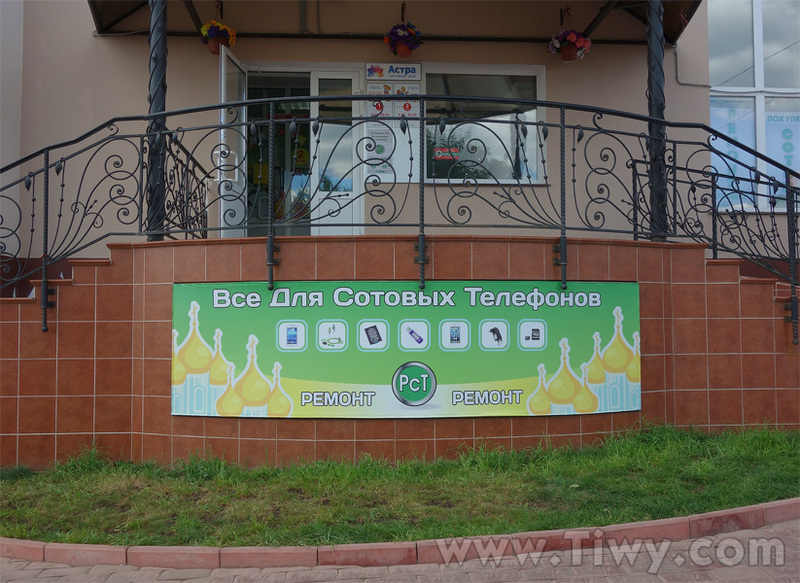 Tiwy.com - Sergiev Posad town, Moscovskaya Oblast (region). Photos, 2014. Sergiev Posad is one of the most popular tourist destinations in Moscow. Despite the fact that I have been to this town several times, to my surprise, I still have no photo or video materials of the past years. The history of the town is connected with St. Sergius of Radonezh, a recluse, who lived in this place in the 14th century and built the Holy Trinity church on the Makovets Hill. Then, a monastery appeared there, and the area around it got populated. About 450 years later, according to the decree of Catherine II dated March 22, 1782, all settlements in this place have been merged into Sergiev Posad town. In 2014, Russia celebrated the 700th anniversary of the birth of St. Sergius of Radonezh. To celebrate the round date, hundreds million rubles were spent for the reconstruction and decoration of the town, and Sergiev Posad became much prettier. In several pages, you can see a photo-sketching made in August, 2014. In the future, it will be complemented, anyway. The town administration have gone too far with the desire to decorate everything but the kitchen sink with the images of church domes. 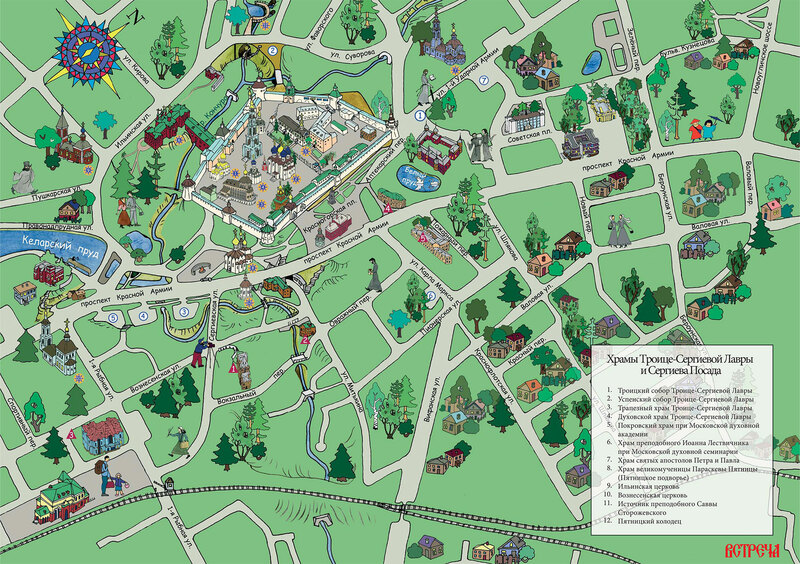 A nice map of Sergiev Posad for tourists and pilgrims. Drawn by the artists of icon painting school under Moscow Orthodox Theological Academy. You can see that the authors worked creatively. The Memorial of Glory with the Eternal Flame in memory of the Motherland defenders, who saved us and the Soviet Union from Nazi invaders. 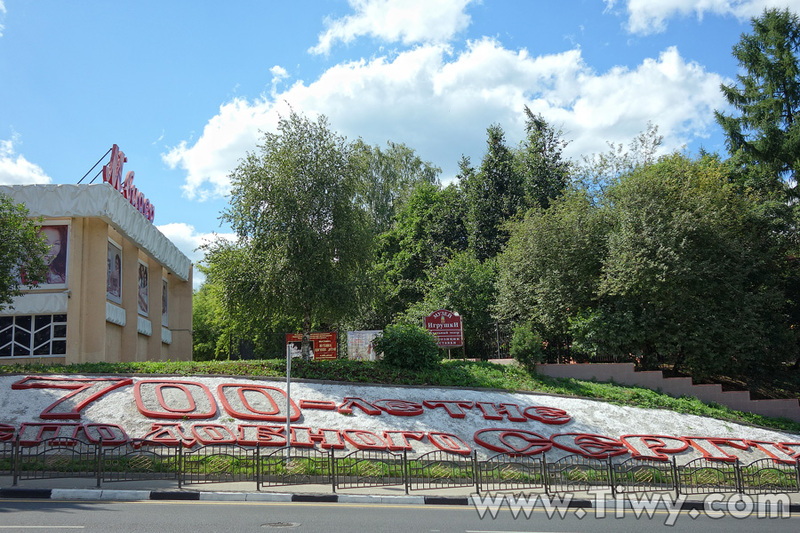 Opened on May 2, 1950 on the common grave of Soviet soldiers.